The Windows error code 0x8007003b a rarely talked about but, has become very familiar. Most computer users who encounter this error happen to be using Windows 8 OS or higher. 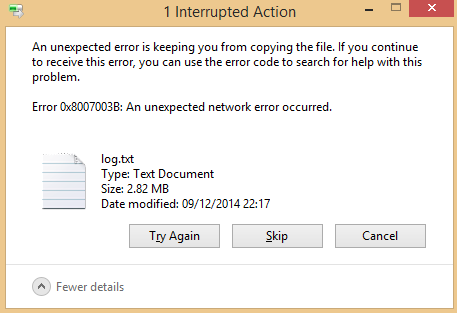 The error 0x8007003b is normally accompanied by the message “An unexpected network error occurred”. Like with any Windows errors, it is critical that you fix 0x8007003b error as soon as you can. This is because although it is network related, it can cause your computer to start running slow. You may also notice some installed programs not working correctly. The most possible moment you may encounter Windows error code 0x8007003b is when Transferring a file from another computer or server over a network. It particularly happens when you try to move a large file, which in most cases is a file of 100MB and above. The file can start transferring very smoothly only to stop abruptly before the appearance of the error and the accompanying message just like below Picture. Unstable network connection, which can also cause bandwidth limitation. A program/software that you recently installed that may have damaged system files or misconfigured system settings. Interference by the built-in Firewall and the installed anti-virus program. Installation/file transfer destination formatting, which may have limitations. Bad sectors in the destination folder, which in most cases is the hard disk. There is no single solution that solves windows error 0x8007003b. It depends on the particular cause on your computer, which may not necessarily be the same with another person’s computer. You may, therefore, need to try out several solutions before you find one that works for you. Solution 1: Check for Virus/Malware/Internet Connection. It is crucial to ensure that your computer’s health is in the good state. It is also important to ascertain whether or not your computer has certain limitations. Perform a full anti-virus scan to take care of virus in the system. Check to ensure that your computer’s network connection is robust and steady. Try to determine whether the installation/file transfer destination (hard disk) is FAT32, or NTFS formatted. Note that FAT32 formatting has limitations. In most cases, the format cannot support any installation/file transfer of more than 4GB. If indeed a file you are trying to move (copy) is more than 100MB, you will need to transfer it to parts to overcome the error. Try to transfer a file you were transferring after these Basic Troubleshooting measures to find out if doing so resolves the error 0x8007003b. The installed anti-virus program can cause different errors including error 0x8007003b in windows. Disable it for the period you transfer a file to find out if the error is resolved. Remember to enable it once you are, though. 1. Right-click on the anti-virus program’s icon. 3. Select how long the program will remain disabled before clicking OK. In Some Anti-Virus Programs, you need to open it and then disable it. So do the needful and try to transfer the files. The built-in firewall can also interfere with the smooth transfer of a file. Disable it for the period of data transfer to find out if doing so resolves the error. 1. Press the combination of Win + R keys to open the Run window. 2. Type “Control Panel” in the window before hitting ENTER. 3. Select “System and Security” within the control panel. 4. Look for the option “Turn Windows Firewall on or off” on the right pane. 5. Select “Turn Windows Firewall Off” just beneath “Home or Work” network location settings. Disabling Firewall will make sure that it doesn't interrupt while transferring the files over network. If this doesn't work to solve error 0x8007003b, You can skip to next solution. You may encounter error 0x8007003b in case you recently installed a program that may have damaged some of your computer’s system files. Running the built-in SFC utility can easily find and repair any such files. 1. Press the combination of Win + I keys to open up the settings app. 2. Click on “Update and Security”. 4. Click “Restart Now” just under the advanced startup options. 6. Click on “Command prompt” to reboot your computer. 7. Enter your username and password once your computer restarts with command prompt. Note that you need to have administrative rights on the computer. 8. Type “wmic logicaldisk get deviceid, (volume name), description. This is important because it informs the SFC utility the location of Windows installation files. 9. Type “sfc/scannow/offbootdir=c:\ /offwindir=D\Windows” before pressing ENTER. The scan should automatically start to run. Close the prompt once the scan is complete before clicking on “Continue” to go exit and return to Windows. Try to transfer a file to find out if doing this helps you to fix the error 0x8007003b. Bad sectors on your computer’s hard disk are a cause of various Windows-related errors including 0x8007003b. You need to run the check for integrity of the hard drive to repair any bad sections on it. 1. Click to open File Explorer. 2. Right-click on the hard drive you need to be checked. 5. Click on “Check” button. The utility should begin to run. Click close once the run is complete, and no errors are reported. This solution will work in resolving Windows error 0x8007003b in a case where you had enabled it. This mainly applies if your computer is running on Windows 10 OS, which does not have the feature automatically enabled. Note that you can only access this feature through the control panel in Windows 10 and not through the settings app. 4. Click on “System Protection” on the sidebar. 5. Click on a past date when your computer without any issues. Your computer will re-boot automatically. Note that you will lose any programs and updates you may have installed after that date. However, all your files will remain intact. Try to transfer a file to find out if the error is resolved. Any one of these solutions should address error 0x8007003b on your computer. Note that it will be necessary to perform a fresh installation of the OS should the error persist.